Last week I blogged about the role of public prayer in sports. What prompted me to blog about the subject was a Detroit Free Press article in which I was quoted that dealt with the trend of major league baseball players praying and performing various religious-related activities on the sports field like drawing crosses in the dirt and blowing kisses to heaven after a home run. Professional and collegiate players giving thanks to God in the locker room after a game is nothing new and neither is a player crossing himself after a touchdown. 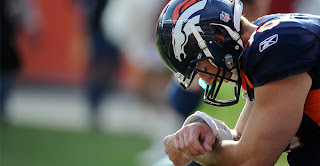 Lately however, this has gone to a new level and that is probably thanks in large measure to Tim Tebow, the NFL player who started the "Tebowing" craze. The Denver Broncos quarterback, who stencils biblical verses into his eye black, drops to one knee in silent devotion in the middle of his games. This act of public prayer has led to people everywhere to start "Tebowing." As a rabbi, I don't have a problem with the Tebowing craze but I think it's funny that it has restarted the debate over public prayer. If a player simply closes his eyes and gives thanks to God no one will notice, but as soon as he drops to one knee it becomes a national obsession. Today's college game between Penn State and Nebraska will only add fuel to this debate. 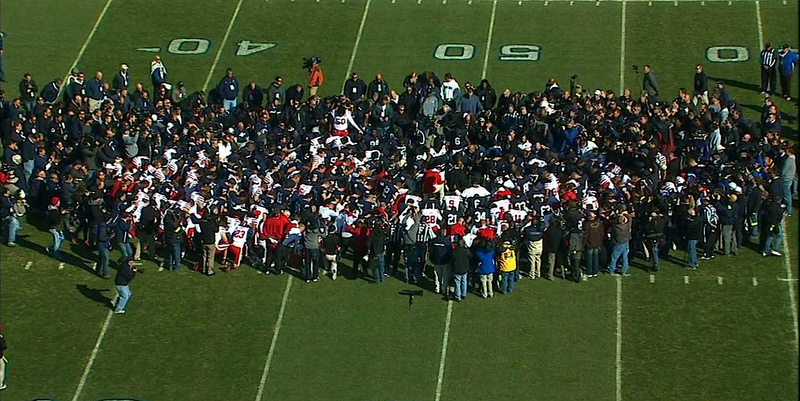 Before the game in Beaver Stadium, the crowd watched as both teams joined together in the middle of the field for group prayer. This prayer service was preceded by a moment of silence for the entire stadium asking for healing for those affected by child molestation. The Penn State campus was already emotionally charged following the forced resignation of its long time coach Joe Paterno for not doing more to stop the child molestation that took place at a youth football camp held on campus several years earlier. No doubt, people will be weighing in on whether it was appropriate for both teams to join in public prayer before the game. After all, this is something that is usually done in the privacy of the locker room. 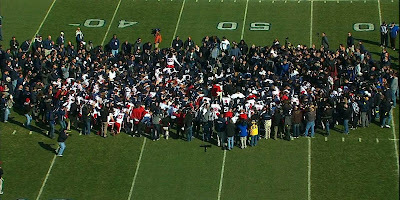 For those who criticize Tim Tebow for praying on the football field for such trivial things as a touchdown pass, perhaps the Penn State-Nebraska prayer service will raise the question of whether its appropriate to pray for serious things on the football field (victims of child molestation, our troops oversees, those battling cancer, etc.). Most likely, athletes are going to continue to publicly pray on the sports field and demonstrate their religious beliefs. And the debate over whether its appropriate or not will continue as well. Hi Rabbi Jason! I must tell you your blog topic is pretty good and the writing of this post admirable. I'm very glad of those players who are praying before performing in the field. It's a really very good habit. I appreciate you for making a good highlight of this concept. I like your blog about the Tebow syndrome. I agree that public prayer should be aimed at a higher purpose than a home run or a touchdown. How can we ask god to intervene in a sporting event, particularly when the primary motive is probably to get more money? In my mind, it trivializes prayer. But what do i know? Nobody has recently offered me a zillion bucks to play ball.